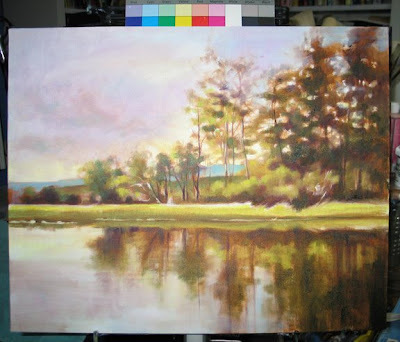 Moving along on this painting, I added some color and it is starting to look like a traditional landscape painting. But, I'm thinking of taking it in a more abstract direction. I should have Saturday and Sunday in the studio to play with it. Happy Halloween. I had a birthday recently and my sister Bettina's birthday is coming up. Ten years ago, she sent me the little book "Because You're My Sister" written by Jan Miller Girando and illustrated by Mary Engelbreit. Every birthday since then, we have added photos and notes to the book and sent it back and forth to each other by US Mail. It is challenging fun to find an old forgotten photo and to write a memory of that year. The book chronicles our house hunting, remodeling, health challenges, our family's annual Women's Weekends, notes from our Sister Whine Line phone calls and history of our family. Some years the entry is little more than Happy Birthday. Other years produce elaborate photo fold-outs. Someday this book will pass on to our children and their children. This year, my sister included a photo of me at almost three years old. I remember the dress, the chair, the feeling of being a "real girl" all dressed up. 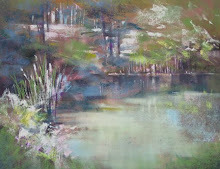 For more than a decade, when my primary medium was colored pencil, I usually used a tonal foundation. 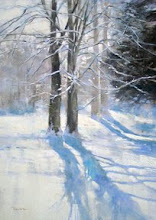 This technique is referred to as grisaille. 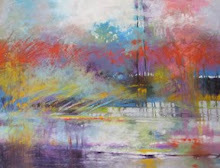 It allowed me to establish value, form and volume independently of color decisions. When I began experimenting with oil paint I didn't use a grisaille, preferring to jump right into color for the little still lifes. 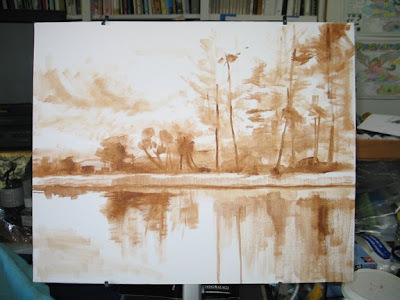 Now focusing on landscapes, the grisaille appeals to me again. Today I added value to the foundation sketch of yesterday. 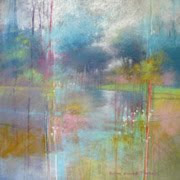 You can see examples of my earlier work using grisaille by clicking here. 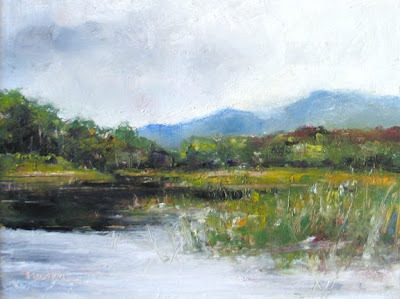 After painting about 50 little oil still lifes, I thought I would go on to paint many little oil landscapes but I feel the need to paint larger. This is still an oil experiment but on a larger scale. Here it is at the foundation stage - just getting an idea of the composition. Next will come the value, then color. 16 x 20 oil on canvas. 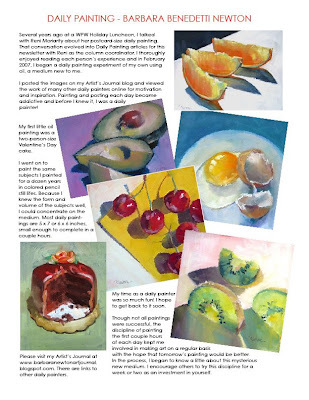 This article was published recently in the Women Painters of Washington newsletter - a brief summary of my daily painting to date. Click on the image to enlarge. ...know when to walk away. The lyrics from Kenny Rogers' song, "The Gambler" come to me often when I'm painting. "You gotta know when to hold them. Know when to fold them. Know when to walk away. And know when to run." For now, I'm going to heed his advice and leave this painting in the foundation stage. 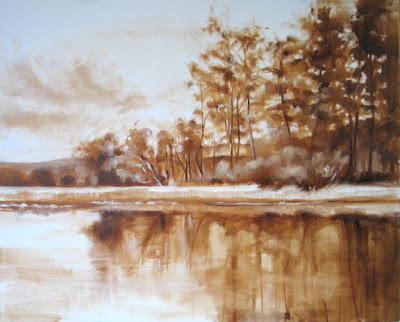 It still has a freshness that I may destroy as I play around with this goopy medium - so different from the soft pastel I am more comfortable with. 6 x 8 inches, oil on panel. Yesterday I met with our long-time Critique Group - a dozen women who are always inspiring and supportive. I came away with motivation to finish the little landscape I started while filling tubes with white oil paint a couple days ago. This is a scene from an afternoon boat ride on Anahim Lake. 6 x 8 inches, oil on panel. I started to paint this morning but when I opened my quart of Titanium White I just had to stop and take care of a problem. As a novice oil painter, I didn't know about the skin that forms on top of containers of oil paint. For months I've been digging the paint out from underneath; no time or enthusiasm for filling empty tubes. But today was the day. I ended up with a very messy palette knife that I finally wiped off onto a previous painting ("Daisy" July 11, 2008) to become a sky. Tomorrow or the next day it will turn into a landscape. 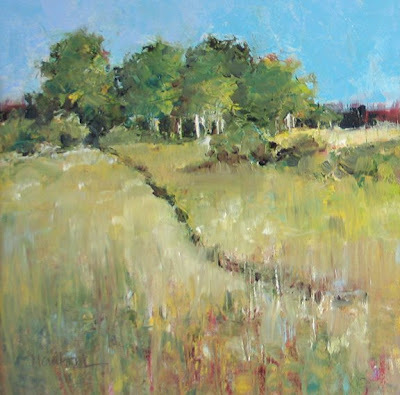 Another little oil landscape experiment; another Canadian scene - a path to the Upper Dean River. 6 x 6 inches, oil on panel. 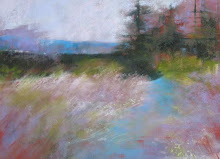 As a new member of the Pastel Society of the West Coast, I was surprised and happy to receive in today's mail an Award of Merit from the 2008 PSWC Membership Show. The juror was George Rivera. You can see the painting and links for more information by clicking here. One of the scenes from late summer in Canada. It is my first experiment painting with a palette knife. Fun! 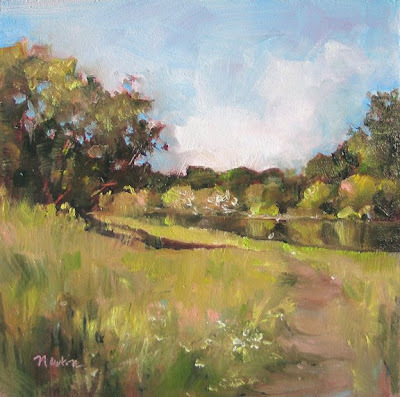 6 x 6 inches, oil on panel. There is nothing like new art supplies. My shipment of Williamsburg Handmade Oil Colors arrived this morning! I want to check email, pay bills, balance the checkbook, and look at future call-for-entries, as has been my summer routine. Instead, I turn the overhead lights off, light the fire and with mocha in hand, settle into the rocking chair by lamplight. Opening my art journal, I turn to the pages of last year at this time. I see sketches for the studio arrangement at the “barn” we built on our retirement property. Since then, our plans have changed; we want to be closer to our grandchildren in Seattle. 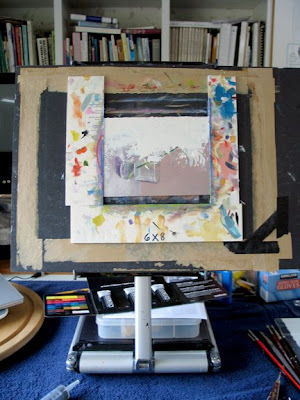 There are quotes and revelations from Dan McCaw’s "A Proven Strategy for Creating Great Art" and Richard Schmid’s "Alla Prima." 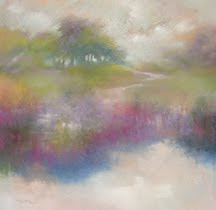 Notes and photos from several pastel paintings I was reworking. Thumbnail sketches, value studies, composition possibilities. 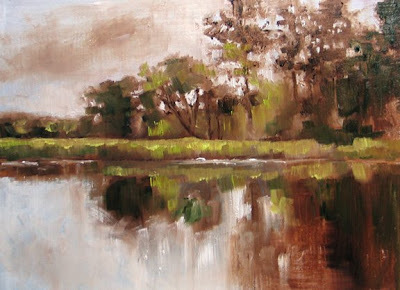 I am reminded how exciting it was to consider oil painting. Around Valentine’s Day I posted my first oil and wondered if it would ever dry. Many little oil still life paintings followed. Then, summer – ending with a trip to Canada and a four day eat-a-thon cruise. There is a need in an artist that can only be filled with creating. 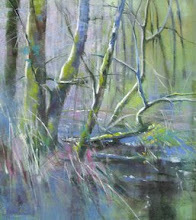 Now, most mornings I hope to be in my rocking chair reading about art and then to the easel for pastel or oil. Wishing everyone a creative last quarter of 2008.